In my last post, I discussed the significance of the new US DOJ policy, effective July 11, that creates a presumption that all federal law enforcement agencies — the FBI, the DEA, ATF, and all the rest, will record interrogations of suspects. This will put these federal agencies on par with the several states and many hundreds of state and local departments that have recorded interrogations for years, as a matter of course. I commented that, without access to the DOJ memorandum itself, there was no way to know whether the new policy would require recording of the whole interrogation, or just part of it (usually, the part that shows a confession, but not what lead up to it). I promised to post again when I had more information. I. g. Scope of Recording. Electronic recording will begin a soon as the subject enters the interview area or room and will continue until the interview is completed. For proponents of recording interrogation, this is good news. A partial recording could only give a partial picture of what went on in the interrogation room. At worst, a partial recording could be downright misleading; at the very least, a recording that only contained the confession at the end of the interrogation would tell us nothing about the context — about how the police obtained the interrogation. So the Scope of Recording requirement is a very important part of an effective recording system. On February 4, the National Registry of Exonerations published its yearly report for 2013. The Registry, a joint project of the University of Michigan Law School and the Center for Wrongful Convictions at Northwestern University Law School, collects information on exonerations that have occurred since 1989. The headlines on the new report (from the New York Times to NBC News to the Huffington Post) nearly all focused on one fact: 2013 saw 87 exonerations, the highest yearly total yet in any year since 1989. This is a significant fact. But two other things in the report got less notice and deserve more. First, for most people, “exoneration” is synonymous with “DNA exoneration.” This is how the world looks, whether on television (think of CSI and its many clones) or in any news source. But this view doesn’t reflect the real world. As the report points out, only about 21 percent of the exonerations in 2013 involved DNA (p. 6). Despite the impression one gets from the media, this has always been the case; of all of the exonerations since 1989, 72 percent were not based on DNA. And that difference seems to be increasing. In both 2012 and 2013, non-DNA exonerations increased significantly, while DNA exonerations decreased (p. 12). This is a very welcome and important development. While some exonerations have always come about with law enforcement cooperation, this was not the trend. Despite assurances from Scott Burns, executive director of the National District Attorneys Association that “we always did that, we just didn’t” have a name for the process (see his quote here), the data on the last two years do show a greater willingness to re-examine old cases than in years past. According to Samuel Gross of the University of Michigan Law School, who edits the Registry, “the sharp, cold shower that DNA gave to the criminal justice system has made us realize that we have to re-examine” closed cases whether with DNA or not. That idea appears to be sinking on a much wider basis. And that is all to the good. Tags: crime lab, criminal justice reform, Department of Justice, failed evidence, failed forensics, forensic, forensic science, forensic testing, forensics, innocence, NAS report, National Academy of Sciences, Resisting science, science, Strengthening Forensic Science in the U.S. Following up on my last post, in which I asked why there were still no national standards for forensic science five years after the National Academy of Sciences’2009 report Strengthening Forensic Science in the United States, and with scandal after scandal in U.S. crime labs all over the country, there may be light on the horizon. On January 10, the U.S. Department of Justice (DOJ) and the National Institute for Standards and Technology (NIST) announced the formation of the National Commission on Forensic Science. Members of the commission will work to improve the practice of forensic science by developing guidance concerning the intersections between forensic science and the criminal justice system. The commission also will work to develop policy recommendations for the U.S. Attorney General, including uniform codes for professional responsibility and requirements for formal training and certification. The formation of the Commission could be the a significant milestone in the march toward the use of real science and defensible national standards in forensic labs. But it may be limited in what it can achieve just by its creation and structure: it is not a body created by Congress with power to come up with and implement standards or to regulate anything. Rather it is a federal advisory committee, formed under the Federal Advisory Committee Act of 1972. (A quick primer on the Act is here.) It investigates and debate designated topics, and then reports its recommendations to the relevant federal department(s) that formed it (in this case, the DOJ and NIST). Those agencies could choose to embrace and follow, or could choose to reject, some, all, or none of the Commission’s suggestions. Still, this is a hopeful sign that we might be heading in the right direction. At the very least, we will see a national conversation between the very large number of Committee members; they come from a variety of backgrounds in government, science, the legal system, and elsewhere. See the list of more than thirty Commission members at the bottom of this announcement. I hope readers will weigh in on the following question: realistically, what will come from the Committee? Will the government adopt these recommendations? Will the recommendations include national standards to regulate forensic testing, assure quality control, and the like? In the end, will the work that you foresee coming from the Commission improve the U.S.’s largely unregulated system? The International Association of Chiefs of Police (IACP) is one of the leading organizations for law enforcement professionals in the U.S. and around the world. I regularly turn to their model policy and training documents when working on those issues for police agencies. So it’s a big deal to see their new report, prepared in conjunction with their partner, the U.S. Department of Justice Office of Justice Programs, announcing that their new effort in which they will play a leading role in fixing the problems in police investigation that cause wrongful convictions. The report, titled, “National Summit on Wrongful Convictions: Building a Systemic Approach to Prevent Wrongful Convictions,” takes a full view of the issues that must be addressed to avoid convicting the wrong people, and announces a series of recommendations designed to bring the goal within reach. It is based on work at a summit of people from IACP, DOJ, and a host of experts. In a preliminary statement in the report, the President of the IACP and the Assistant Attorney General for the Office of Justice Programs, outlined how the report came to be and what it does. This event gathered 75 subject matter experts from all key disciplines to address and examine the causes of and solutions to wrongful convictions across the entire spectrum of the justice system. Summit participants worked diligently during this one-day intensive event to craft 30 focused policy recommendations that guide the way to our collective mission to continually improve the criminal justice system. The summit focused on four critical areas: (1) making rightful arrests, (2) correcting wrongful arrests, (3) leveraging technology and forensic science, and (4) re-examining closed cases. The 30 resulting recommendations directly address these areas and lay a critical foundation for required changes in investigative protocols, policies, training, supervision, and assessment. The report makes thirty recommendations on a number of topics: eyewitness identifications, false confessions, preventing investigative bias, improving DNA testing procedures, CODIS, correcting wrongful arrests, leveraging technology and forensic science, and re-examining closed cases with an openness to new information. The report is absolutely essential reading for anyone interested in wrongful convictions and what can be done to correct them. 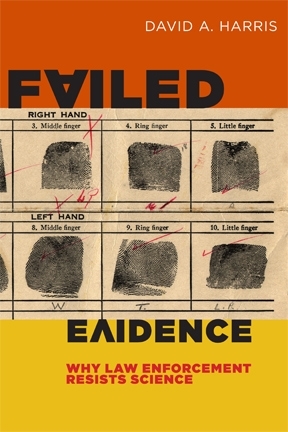 Readers of my book Failed Evidence will also recognize that the emergence of this consensus at the top of the law enforcement profession is exactly what I have called for: “Police and Prosecutors Must Lead the Effort” (pp. 158-159). With the news that the District Attorney of Brooklyn is re-examining convictions in 50 cases featuring the work of one particular detective (see stories here and here ), we see two issues that have surfaced on the Failed Evidence blog before: false convictions and Conviction Integrity Units (CIUs). But there is also this: the re-examinations are being handled by the Brooklyn DA’s Conviction Integrity Unit (CIU), which I wrote about in connection with the exoneration and release of David Ranta, here. As readers of the Failed Evidence blog know, CIUs are dedicated units within prosecutors’ offices, just like homicide or fraud units, that take on the task of re-opening old convictions now in doubt. The first CIUs were established by DA Craig Watkins in Dallas and former DA Pat Lykos in Houston, and they have begun to pop up in other places. In New York, both the Brooklyn DA and the Manhattan DA have established CIUs. The CIU model for examining possible wrongful convictions isn’t perfect; a CIU is, by its nature, not independent of the DA’s office, and could be stopped in its tracks or dismantled completely just as easily as it could be created. But as I’ve argued here before, they at least represent a step toward accountability for wrongful convictions, in a field in which too few elected prosecutors will touch prior convictions at all. We should pay careful attention to how this large-scale investigation by the Brooklyn DA’s CIU works out; it will say a lot about whether CIUs can be part of the solution going forward. I’ve written before about Conviction Integrity Units (CIUs) in prosecutors’ offices (take a look here and here). CIUs are groups of lawyers within prosecutors’ offices — just like a major crimes unit or a narcotics unit, though probably much smaller than either of these — with the job of investigating questionable past convictions from that same office. CIUs do this when presented with evidence that raises real doubts about the guilt of a convicted defendant in one of the office’s past cases. The first CIU was established by Dallas DA Craig Watkins, who had then just been elected against a backdrop of more than 20 exonerations of people wrongfully convicted under the past leadership of his agency. (The latest story about Watkins and the exoneration of wrongfully convicted people in Dallas — examining a fascinating twist on exonerations — is here.) Just a couple of years later, Patricia Lykos, then the newly elected DA in Houston, established a CIU in her office. From Texas, the idea has begun to spread. Both the Dallas and Houston CIUs have one thing in common: they were launched by new DAs to investigate cases that originated under former administrations. No doubt this is easier than investigating mistakes that have happened under one’s own watch. That’s what makes this story out of the Brooklyn DA’s office so interesting. Charles Hynes, the elected DA of Brooklyn, established a CIU that will be looking at cases in which prosecutors obtained convictions during his own six terms in office. For example, at the end of March, David Ranta, 58, was released after spending 23 years in prison for the killing of a rabbi in Williamsburg, Brooklyn. The original conviction came under Hynes’ leadership; when Ranta was released, Hynes gave credit for the release to his CIU. CIUs accomplish something very fundamental: they make the task of uncovering mistakes in the justice system into a routine operation. On the other hand, as readers of this blog have correctly pointed out, CIUs are a lot like internal affairs divisions in police departments: the DAs are investigating themselves. This is easier to credit when the head of the office is not the same person who was at the helm when the mistakes were made. It is also why CIUs are still rare when the head of the office has been serving a long time — long enough to be the one responsible for the mistakes under investigation.